Not a lot of time today ( just happy I had time to make the card!) So here's a few things I learned. 1. I hate the Fiskars swivel fingertip knife. A lot. It may or may not be residing in my garbage can. 2. There's something funky about my red embossing powder. Even with the embossing buddy it left a red film of powder on the paper that was hard to get off. 3. I love ruffled ribbon. Thanks ! Have fun hopping!! I love the list you included on your post, Rose. I haven't tried the fiskars swivel fingertip knife, but I definitely won't search one out now! LOL! Your card is beautiful-- so elegant and lovely! What a pretty card. I love the white and red with black. I think I have yet to use that stamp that you say you have used up! I guess I am getting old. So pretty! Love the CAS layout, and that ribbon is perfect. Very pretty card. Black and red and white work so well together. LOVE the window and the three rows of ribbon and the bling! PRETTY card! Rose, I love the ruffled ribbon and the window you created! 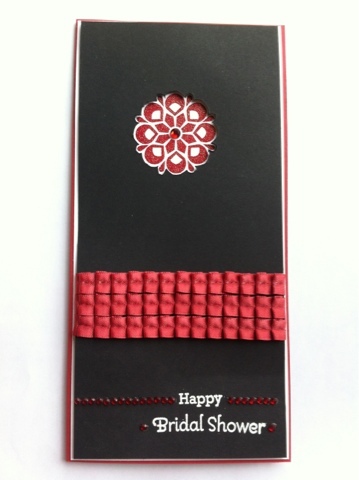 the red ruffled ribbon and the embosses image are very elegant! Perfect look for a very sophisticated shower card! I feel your embossing pain - so frustrating when the powder doesn't behave - but your card is pretty and I love the embossed image! Very pretty! I love that ribbon!